The Prescott Computer Society has a current membership of over 100. Our members generally live in Prescott and Prescott Valley, Arizona as well as the surrounding areas of Yavapai County. We hold several meetings each month on a variety of different computer topics according to the schedule on our Home page. This area contains recent back issues of the PCS weekly email newsletter, membership list and the Presentations and Articles database. The latter allows you to download meeting handouts, the presenter's notes in PDF format and computer-related articles written by PCS members. The weekly email newsletter contains up-to-the-minute information regarding meeting presenters and their topics. This newsletter, sent out every Monday morning, contains computer Tips 'n' Tricks, schedule changes and club news items. Dues are only $24 per year per household and are used for the purchase of computer equipment, meeting room expenses and picnic supplies. During this economic climate, the PCS Board of Directors has tried to be as frugal as possible. We have encouraged ourselves as well as our members to use free software. In 2010 the Board set the annual dues at $24, a twenty percent reduction from the previous year. 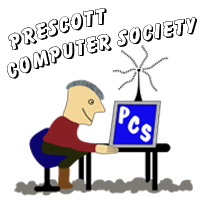 All you need to do to join PCS is to mail in a membership application form and your dues. The form includes a pro-rated dues chart as well as mailing information. Our handout brochure is available here in PDF format. The brochure includes additional information about PCS. Additional membership information may be obtained by contacting our Membership Chair, Murray Smolens.